friendship | Shelf Elf: read, write, rave. I have been a very busy lady for someone who is technically “on holiday.” Holiday, schm-oliday. When I haven’t been: a) learning about teaching Kindergarten, b) reading about teaching Kindergarten, c) dreaming about teaching Kindergarten, d) hunting and gathering at garage sales so that I have stuff with which I can teach Kindergarten, I have been doing Absolutely Nothing. (Okay, there has been some cocktail-drinking and BBQ-eating and extremely lazy watching of mindless television, but that’s about it. Barely any reading at all. I can’t stay awake folks. It’s a problem). And so it has taken every tiny bit of resolve I could scrape together to get in front of this computer screen and attempt to string a few sensible words together. A Year with Friends. Gosh this is a pretty wee book. It practically sings Kindergarten. It’s a journey through the year, a celebration of the seasons and the great outdoors starring two kids and their furry sidekick pets. The text is perfectly simple: “January is time for rolling down hills. February is time for snuggling. March is time to hold on to your hat. April is time to get messy…” Each idea is open enough to leave kids room to ponder, and the wonderfully bright, expressive artwork showcases the children taking charge of their own experiences and making their own fun. I like that most of the activities are outdoors. The kids are busy chasing things and making things and having those many small adventures that constitute the best kind of childhood. This is a cosy read, a perfect introduction to the pleasures of different times of year and friendship and simple things. A Year with Friends is understated and just right. I’ll be trying it out on the little people sometime this fall. 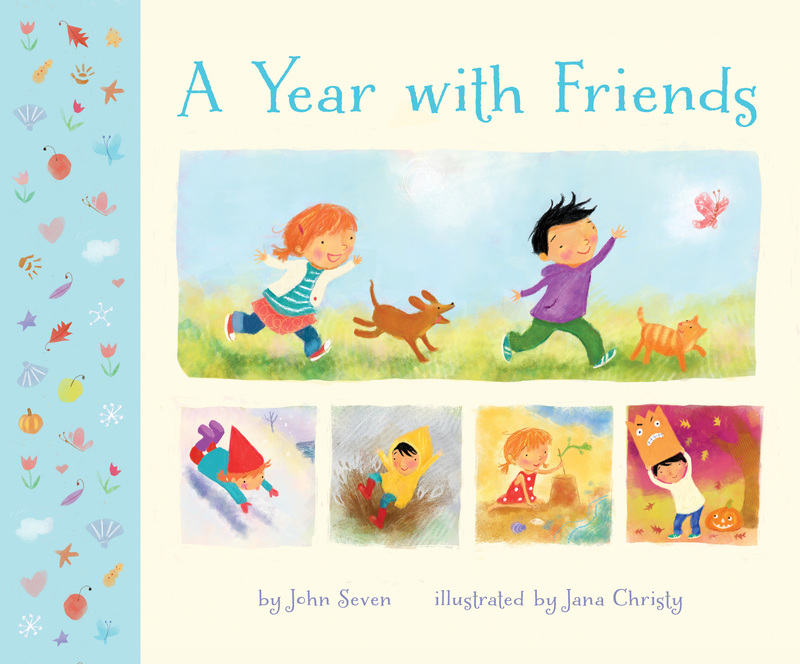 A Year with Friends is published by Abrams Appleseed. This entry was posted in Picture Books and tagged Abrams Appleseed, friendship, Jana Christy, John Seven, seasons on July 21, 2013 by shelfelf.